On a hazy June afternoon, Carrie Dyer sits at a picnic table near the playground in Battery Park in Burlington. With one arm she’s holding her three-month-old baby, and with the other she’s sipping water from a bottle. Dyer turns to encourage her seven-year-old daughter who is working her way across the monkey bars. Then she takes another sip of water, brings her baby into a close embrace, and continues talking. Now Dyer is trying to get unstuck. “When I used to work traffic control I was up to four packs a day,” she says. But on January 5, 2014, well into her second trimester of pregnancy, at age thirty-eight, she quit. Her baby—her fourth child—was born in March. The “UAs” are urinalysis tests for nicotine. And what she started was participating in a clinical research study at the College of Medicine’s Vermont Center on Behavior and Health, directed by professor and vice-chair of psychiatry Stephen T. Higgins. Higgins is particularly interested in one kind of behavioral intervention: incentives. For her healthy behavior—not smoking—Carrie Dyer gets paid. A clean urine test means a very tangible reward—cash or vouchers for merchandise. To this day, there are no FDA-approved medications to treat cocaine addiction, but Higgins and colleagues’ success with retail vouchers as a fundamental part of treatment for cocaine addicts led them to explore how this approach could work with other types of addiction. 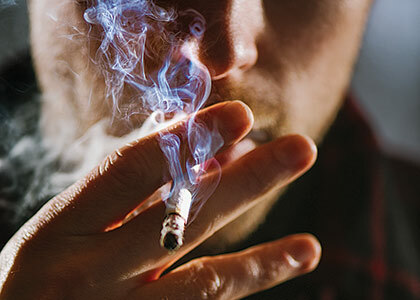 The Center on Behavior and Health will expand on several decades of research by a large team of UVM scientists that includes fundamental discoveries on the treatment of opiate and tobacco addictions—and how to help especially vulnerable or difficult-to-treat groups like pregnant women, low-income people, and those with co-occuring mental illness. Higgins, the professor who leads this multi-disciplinary effort, grew up in a tough working-class neighborhood in Philadelphia. He’s the first in his family to have gone to college. He saw heroin epidemics sweep through his community, killing people he knew. He saw the Vietnam vets coming home hooked to painkillers. It’s tempting for a journalist to spin a tidy story of origin about how Higgins chose a career studying behavioral psychology with an aim to treat addictions and other health problems in poor communities—helping people in need. And it’s that same part of the brain that responds chemically to cash or a voucher, rewards that can make a small difference in an individual’s standard of living—helping to pay the electric bill or buy a tank of gas—but, much more importantly, could help save a life through healthier behavior. Most people who survive a heart attack could benefit from rehabilitation. A program of education and exercise increases quality of life and decreases chances of dying from heart disease—but less than 35 percent of eligible patients participate in rehab programs. And a vanishingly small number of cardiac patients from marginalized parts of society—low-income or homeless or with substance abuse histories—even start. Psychologist Diann Gaalema and Dr. Philip Ades, a cardiologist, are working to reach these particularly vulnerable populations through a cardiac rehabilitation study built upon the same incentive-based techniques that Professor Stephen Higgins and colleagues have used to treat addiction. “The reality is that if you’ve had a heart attack you are going to have to change the way you live, and that change will need to be life long,” Gaalema says. She points out that even the four months of a cardiac rehab program can be a long and difficult time for patients to maintain their new behavior. “The idea behind incentives is that it breaks down these difficult behaviors into small, achievable chunks. Putting the focus on what they can do and achieve today helps people take these intermediary steps toward the longer goals they’ll need to meet. It really is a form of treatment and much more subtle than just paying people to do healthy things,” she says.